We have 4 machines of raw material cutting and shaping into various shapes required. 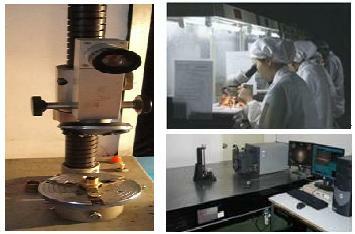 which could most meet our customers requirement for optics in small or volume quantities. we have over 20 polishing equipment and 2 double polishing machine,that make us the capability for volume production with very short delivery time to meet our customers requirement.we have the machine to make metal toolings to support the production. We have equipped with ZYGO GPI-XP interferometer,<?xml:namespace prefix = st1 ns = "urn:schemas-microsoft-com:office:smarttags" />0.5 second goniometer,Trioptics Opticentric ,Microscopes,etc.our experienced staff can make sure the optics to meet our customers requirement before the shipment. On March 2009,we introduced ultraviolet spectrophotometer Pekin-Elmer Lamda 950,which enable to make the coating inspection on the spectrum required by our customers.